Monica T. Vaca, Operations Manager & Registered Options Principal, started working in the securities industry in August, 1990. Her career in the industry began at Shearson Lehman Brothers as a Junior Sales Assistant to a commodities trading desk. She then moved to Prudential Securities as a Sales Assistant to a bond trading group. In 1994, she joined PaineWebber, Inc., after passing the Series 7 License, and joined a diversified trading group, involved in REPO and REVERSE REPO investments as well as equities and equity options. She later joined the PaineWebber, Investment Advisor Training Program and attained the Series 63 and Series 65 Licenses. 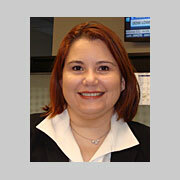 Monica joined Portfolio Resources Group as Operations Assistant and liaison to a group of brokers in October 2003. In 2006, she became Portfolio Resources Group Operations Manager and in 2007 she became Portfolio Resources Group Registered Options Principal. Monica has a Bachelor of Arts in English from Florida International University.